The corruption in South Africa is so bad, it’s like a noxious fog that has settled on a once peaceful, prosperous, and prejudiced nation. 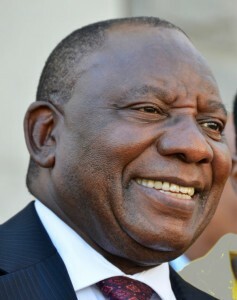 South African’s President Cyril Ramaphosa (left) is being pilloried, pulled, and pushed from many sides, and many of the political players are more radical than he. He is busy trying to stay in power and get reelected later this year, but he has to deal with many warring factions inside and outside the African National Congress (ANC), plus the murder for hire of wayward members and multiple acts of sabotage in many major cities. Everyone seems to carry guns or has bodyguards even low-level provincial (state) leaders. The time has come, it is the end of the so called ‘ Democracy ‘. Censorship is now the norm, it is referred to as ‘moderation’ by those who conform to the corrupt world system. Be assured, it is all in vain, the truth will prevail. The author does not know much about S.A. and the article is hugely biased and whilst the article has truths in it, it is not the complete story. It has been written by a right wing person and has little balance, largely sensational or at the very least flowered out to make a readable article. I would like to know how Cyril made the billions he has. I suspect I know here the money came from. I would like to know how Cyril made the millions he has. I suspect I know where the money came from and I don’t think it was an illegal point but it is an unethical and immoral story. We are all whores it just depends on the price,hey! I guess if I were offered a millions as a person in an influencial position I also might well accept the money, as we all would.